I received $1086 in dividends for March which is a nice increase 3 months ago. 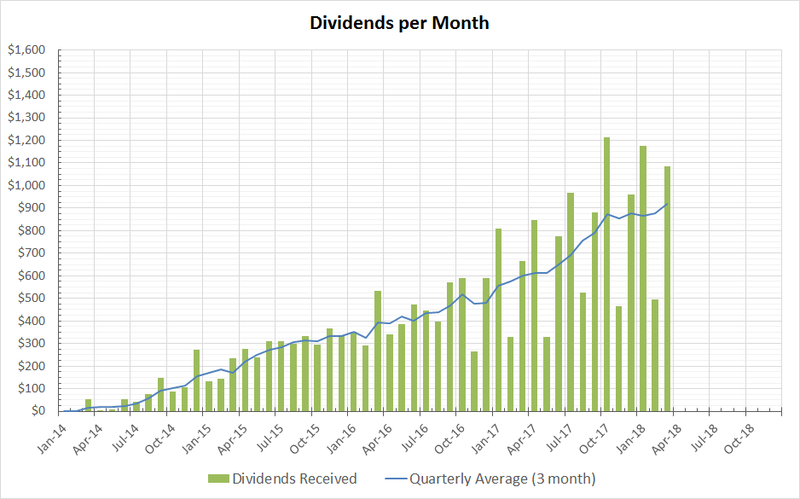 It is nice seeing the dividends hitting 4 figures per month. The dividends paid in March were reinvested excluding SO's remainder amounts. In April I am expecting a nice $1200 in dividends. May will be lower at probably $550 but I think I will be able to add much more shares by then which will help boost that monthly value. Now that's a nice passive income stream. Congrats on hitting a four digit month. As always, it's cool seeing quite a few names in common between our portfolios. Keep up the good work! Young Div, I googled Beast Mode and it brought me straight to this page. =) Congrats on hitting 4 digits! I know you are excited for next month because of your PM and MO holdings. Hell I'm excited with you. Awesome work! That is an amazing month. That is awesome that you are achieving 4 digits a month with your dividend income. I wished that I was able to hold individual stocks in my 401k like that. Great month. Thanks for sharing. Congratulations. That is a really nice month. And looking at your quarterly average curve, you are on a very good path to hitting a very nice passive income and thus your 1M goal with your strategy. Nice growth you got there. I'm sure you will achieve your goals at this rate. Also, four digits is a nice milestone.